Kuhlberg, Mark. "Pulp and Paper Industry". The Canadian Encyclopedia, 30 November 2017, Historica Canada. https://www.thecanadianencyclopedia.ca/en/article/pulp-and-paper-industry. Accessed 18 April 2019. The pulp and paper industry consists of manufacturing enterprises that convert predominantly woody plant material into a wide variety of pulps, papers and paperboards. The Canadian industry began in the 1800s, and has undergone revolutionary changes over the years. Most recently, the move from newsprint to electronic media caused the industry to decline; however, pulp and paper remains a fundamental part of the Canadian economy, especially for remote and northern communities. 1. Harvesting the trees. 2. Cut into logs and taken to the mill. 3. 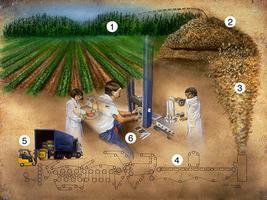 Machinery turns the wood chips into pulp. 4. Pulp is mixed with water and poured onto a long machine. 5. The fibres bond to one another at the dry end of the machine. 6. Researchers perform tests at each stage (artwork by Claire Tremblay). On the Saint John River, New Brunswick (photo by Al Harvey/Masterfile). Typically, paper has been made from "pulping" or crushing fibrous plant or woody material into its cellulose components using either friction or chemicals. During this process the waste, or non-cellulose material, is eliminated, as is the water, which is removed using heat and pressure, resulting in paper. The world’s first sheets were made in ancient Egypt by layering thinly-cut strips of papyrus plants at right angles (the word "paper" is derived from papyrus). However, the modern process of turning pulp into paper was born in China during roughly the earliest part of the Common Era. When knowledge of this enterprise migrated to Europe near the end of the first millennium, the raw material of choice for paper-making became animal skins and the product was called parchment paper. Its high cost spurred a search for a cheaper raw material, namely old cotton and linen rags. By the 19th century, trends in the Western World — including rising literacy rates and the proliferation of high-circulation newspapers — spurred a drive to find an even less expensive raw material, and wood was chosen. European (largely German) papermakers developed machines to break down logs from various tree species into pulps and also dry and flatten the pulps using a series of rollers that grew progressively larger and faster. This allowed for the mass production of many types of pulps and papers, of which newsprint was by far the least expensive. The former were turned into an ever-widening array of items, most importantly personal hygiene products such as tissues and toilet paper. Canada’s pulp and paper industry was born in the early 1800s. During its nascent years, the industry was relatively tiny, diversified and localized. Initially, the need for paper was met by importing it from the United States. But as the colony’s population grew, so too did demand for paper, spurring the industry’s growth. Paper producers were initially clustered in the urban centres of Ontario, Québec and Nova Scotia. They located there to be near their raw material (rags) and markets, and most were erected by newspaper proprietors. The first of these enterprises was built over the course of 1803–1805 by James Brown. His Argenteuil Paper Manufactory in St. Andrews East (near present-day Montréal) was associated with the newspaper now known as the Montreal Gazette. The development of Canada’s modern pulp and paper industry took place in the second half of the 19th century, and was marked by several trends. First, the industry paradoxically both diversified and specialized. It began churning out much larger volumes of a wider variety of products, including book paper, printing paper, wallpaper and wrapping paper. At the same time, the demand for newsprint was growing exponentially, and it spurred a number of entrepreneurs to focus exclusively on manufacturing this type of paper. John Riordon was on the vanguard of this movement, and his devotion to it earned him the title, ‘the father of the Canadian newsprint industry.’ He built his flagship mill in Merritton, Ontario, along the Welland Canal, roughly five years before Confederation. Soon after 1867, Riordon’s firm arguably became the first in Canada to convert to using wood instead of rags as its raw material — marking one of the most important industry shifts to take place over the last quarter of the 19th century. In very short order, the country’s bounty of conifer forests and untapped water powers were eagerly sought by pulp and paper makers at home and abroad. They were interested specifically in producing newsprint, both because American demand was growing exponentially and Canada’s spruce and hydroelectric resources were its crucial raw materials. They were eyed most intensively by producers in the Northeast US, whose concerns were deepening over their rapidly dwindling supplies of pulpwood trees. The construction of a railway through Northern Ontario around this time helped render this region’s trees and cascades accessible for development. During this time, provincial governments were thrust into playing a central role in Canada’s pulp and paper industry. Canada’s colonial legacy and the British North America Act had given them control over crown resources (i.e., public land, timber, minerals, water power, etc.). This meant that governments in Ontario, Québec and British Columbia, whose hinterlands were blessed with abundant supplies of trees and water power, held potentially enormous authority over the industry. The same was true in less well-endowed provinces, provincially those in the Maritimes. That authority was reinforced by the provincial governments’ decision to lease — and not sell outright — the timber and hydraulic resources the industry sought. When the Ontario government began executing such deals with mill developers in the 1890s, they set a precedent of landlord-tenant relationships between the politicians and the industry that other jurisdictions would soon emulate. During this period the Canadian pulp and paper industry enjoyed a prolonged period of meteoric growth (roughly until the mid-1920s) but then endured a sustained downturn. The good times were largely a function of the dramatic expansion of the newsprint industry, and its boom was fueled by numerous factors. These included the practically irresistible allure of the country’s timber and water power resources (especially in northern Ontario and Québec), the end to the American tariff on newsprint on the eve of the First World War, declining supplies of spruce in the Eastern US, and the increased drive to produce close to the burgeoning newsprint market in the Midwestern states. The result was a string of new mills — and communities around them — across the hinterlands of Ontario and Québec, with a smattering also erected in British Columbia, the Maritimes and Newfoundland (an anomalous plant was built in Pine Falls, Manitoba). Canada therefore emerged as the world’s preeminent newsprint maker, one that was highly dependent on supplying the American market. The industry’s annual capacity exploded from approximately 60,000 tons at the turn of the 20th century to roughly 65 times that total three decades later. These years saw the industry undergo a major consolidation that affected its behaviour. Initially, it was made up of a large number of smaller firms, but gradually it came to be dominated by a few behemoths. In Québec and the Maritimes, Canada Power and Paper, Canadian International Paper, and Price Brothers rose to the top, while in Ontario it was Abitibi Power and Paper. The few newsprint companies in British Columbia — Pacific Mills and Powell River — operated virtually independently of their eastern rivals. There were a few exceptions to this rule, namely the newsprint companies which were owned in whole or in part by American newspapers. The Chicago Tribune, for example, built one mill in southern Ontario in 1912 and a second in Baie Comeau, Québec a few decades later. Similarly, the New York Times owned roughly half the enormous mill that was constructed in Kapuskasing, Ontario, in the mid-1920s. Nevertheless, the industry remained heavily weighted towards a few dominant players, and this boded well for its efforts to operate as a cartel, which recurred throughout this period. In the mid-1920s, the newsprint industry began a downturn that lasted well into the next decade. Contributing to this decline was the industry’s overexpansion and enormous capital requirements. Massive amounts of money were needed to erect the enormous new pulp and paper plants and the often ancillary power-generating facilities. This dynamic transformed the industry from one dominated by family-owned firms to those that relied on the ability to obtain financial backing, principally from the US. As the industry’s demand for capital grew, this situation quickly became problematic, as financial backers increasingly sought to generate profits from marketing and selling the enterprises’ securities as opposed to their pulps and papers. As a result, the industry became egregiously overcapitalized, encumbered by huge fixed borrowing charges, and largely controlled by American interests. By the early part of the Great Depression, nearly all the firms in Ontario and a few in Québec had fallen into receivership, while others teetered on the brink of insolvency. By the late 1930s, the situation had stabilized, but the industry was still suffering from significant overcapacity. While the newsprint makers lorded over the Canadian pulp and paper industry, its other sectors (which made items such as cardboard and pulp wadding) enjoyed far more stability and prosperity during these years. They produced pulps and non-newsprint grades of paper almost exclusively for the "home market," which consisted of Canada and the British Empire and was protected by favourable tariffs. Able to exert highly effective control over these areas, as a group these non-newsprint producers remained relatively small yet profitable, and each sector was dominated by a few key firms. For example, nearly all the capacity in the fine paper industry (including both writing and book paper) lay in the hands of E.B. Eddy, Rolland Paper, Howard Smith and Provincial Paper in Central Canada. The early years of the Second World War triggered nearly three and a half decades of practically uninterrupted good times for Canada and its pulp and paper industry. In no uncertain terms, newsprint remained king and highly concentrated in Québec and Ontario. There, the provincial governments supported the newsprint makers’ drive to exercise monopolistic control over their industry, principally by refusing to allow new mills to be built. This policy dictated that the only means by which a company could increase its capacity was by upgrading its existing facilities, which entailed adding ever-larger machines and also speeding up the rates at which they produced newsprint. This the industry did with remarkable effectiveness. Whereas it had the capacity to produce roughly 4.3 million tons of newsprint on the eve of the war, by the early 1970s its capacity had more than doubled. These years also saw ownership of and control over the industry shift back into Canadian hands, with firms such as Abitibi becoming emblematic of Canada’s world dominance in this domain. Despite this supremacy, newsprint makers also faced certain challenges that only grew over time. For example, they faced increasing competition from producers in the Southern US and Scandinavia, as well as rising production costs. As a result, the industry intermittently suffered through difficult times, which entailed temporary mill closures and shutdowns and the steady erosion of its international predominance. At the same time, production of other types of papers in Canada grew modestly. Producers of packaging papers, for example, augmented their operations largely through mergers and acquisitions, and a few dominant players emerged. Bathurst Power and Paper joined forces with Consolidated Paper in the mid-1960s to form Consolidated-Bathurst, and Brompton Pulp and Paper merged with Dominion Tar and Chemical to create Domtar, which remains one of the Canadian pulp and paper industry’s central players. But the greatest growth occurred in the country’s pulp industry. This expansion was fueled by the barriers that existed to entering the newsprint industry, the interest in exploiting previously unused tree species and the drive by foreign interests to secure dependable and relatively inexpensive sources of raw pulp. Most important, however, was the nearly obsessive push by several provincial governments to exploit their control over crown resources to foster economic development, specifically in the form of new pulp mills. In the late 1950s, for instance, the Nova Scotia government convinced a leading Swedish pulp and paper maker, Stora Kopparberg (now Stora Enso), to construct a major sulphite pulp mill in Port Hawkesbury by offering it access to the local supply of pulpwood. Similarly, the British Columbia government facilitated the construction of over a dozen new bleached and unbleached pulp mills that made kraft; their output generally went into making paper products that were known for their strength and not colour (kraft means “strong” in Swedish, and typically kraft paper is brown). Many of these new mills were built in British Columbia’s interior during the 1950s and 1960s because of the provincial government’s willingness to provide them with guaranteed supplies of inexpensive fibre. These years also saw the pulp and paper industry establish major operations in the Prairies, principally in Saskatchewan and Alberta, and these projects were backed by both domestic and foreign interests. As a result, during this period the Canadian pulp industry’s capacity rose from just over 4 million tons in 1939 to approximately 23 million tons in 1972. The latter figure represented nearly 25 per cent of the world’s capacity, with most of it geared towards producing kraft pulps for sale on the open market. 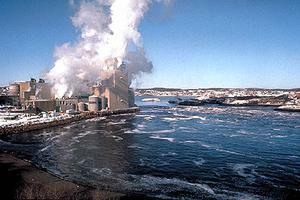 The Canadian pulp and paper industry enjoyed buoyant periods during these years, but its challenges continued to mount. In terms of the provincial governments, some continued to play positive roles in the industry’s development. In Alberta, for instance, the government offered luxurious financial incentives during the late 1980s as a way of diversifying the province’s resource economy. These efforts produced a half-dozen new pulp mills, most of which made kraft pulp, and were erected by American, Japanese and Canadian interests. Paradoxically, these years also saw the provincial governments’ involvement in the industry’s affairs become an unprecedented hindrance to its success, specifically because of the rise of the modern environmental movement. Born in the late 1960s, it was highly adept at exploiting the modern media to convey to the public gruesome images of the industry’s logging practices and the effluents that spewed into the air and water from its mills. It quickly gained significant political traction, and led to the enactment of increasingly stringent environmental laws at both the provincial and national levels. For the industry, this meant much higher production costs but a much "greener" modus operandi. Other factors created huge hurdles for all Canadian pulp and paper producers to surmount. The federal government continually rebuffed their moves to consolidate their operations for fear that this would monopolize the industry, and this attitude hindered the domestic industry’s ability to gain the mass needed to compete with its global rivals. Its production costs also increased dramatically during this period because of rapidly rising prices for both energy and labour. Moreover, its competitors both old (the US and Europe) and new (Asia and the developing world) generally enjoyed much lower production costs and the added advantage of utilizing the latest technology. This situation was exacerbated by the enactment of new laws in the US that required ever-higher proportions of recycled paper in products such as newsprint, a move that undermined the Canadian industry’s principal advantage of being able to access high-quality virgin fibre. For the newsprint sector, these changes and its inadvisable business strategy were particularly devastating. Its position as a global leader continued to erode; by the end of this period it represented well under 30 per cent of the world’s productive capacity, and much of it was inefficient. Moreover, the industry demonstrated a remarkable blindness to changing trends in paper consumption and an unshakeable faith that its salvation lay in creating ever-larger enterprises. Abitibi Power and Paper was the best example of this line of thinking. It first acquired Price Brothers in the mid-1970s, and roughly two decades later merged with Stone-Consolidated to form Abitibi-Consolidated. Amidst the difficulties that beset the entire industry, however, there were some bright spots. In the main it remained profitable, and it invested in new, vastly more efficient technology, such as thermomechanical and chemi-thermomechanical pulping processes (the former uses heat and friction and the latter chemicals, heat and friction to extract the fibres). 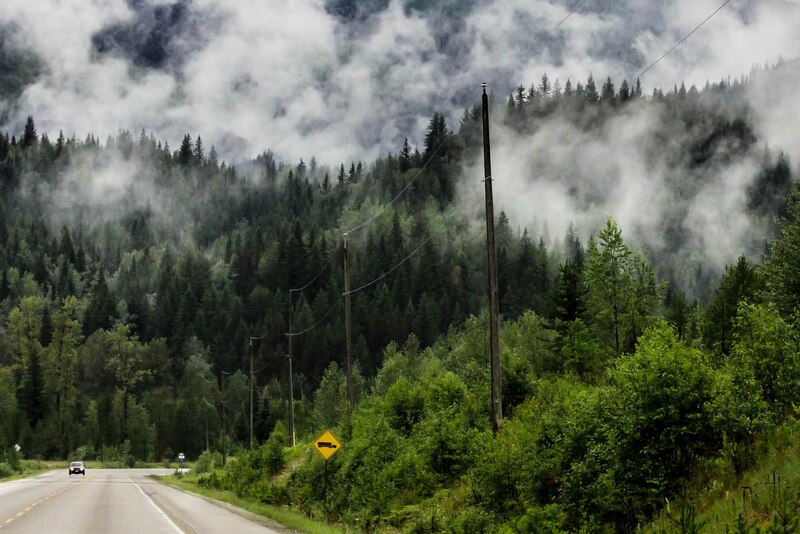 Moreover, the industry became a leader in terms of forest stewardship and pollution control, and by the late 1990s Canada had become the world’s largest producer of paper grade market pulp. The first few years of the millennium were prosperous for the Canadian industry; however, a host of factors combined to deal the industry, and in particular the newsprint sector, a blow that left it practically dead. Canada’s primary newsprint market, the US, witnessed a precipitous decline in newspaper circulation as more readers migrated to electronic media sources. Moreover, pulp production in the developing world, particularly South America, exploded. And these mills operated in a business climate that enjoyed far lower manufacturing costs and a source of raw fibre that could be “farmed” on a relatively short rotation. Then, in 2008-2009 the Canadian dollar shot above its US counterpart and the American housing market crashed, while the Canada-US softwood lumber dispute intensified to the point where it bankrupted many sawmills which had been the main suppliers of wood chips to nearby pulp and paper producers. Together, these forces represented the pulp and paper industry’s worst nightmare. Not even one decade into the new millennium, pulp and paper mills were closing on what seemed like a weekly basis. Unlike previous downturns, this one saw many of the shuttered enterprises being gutted of their equipment; they would never operate again. As the dust settles on the havoc that rocked the industry during most of the 21st century so far, the picture is still unclear as to what lies ahead. Despite all its ailments, the industry remains a mainstay of the Canadian economy, particularly in remote and northern hinterland communities. The forest industry as a whole (both pulp and paper and lumber) employs directly and indirectly nearly 600,000 workers (2012) and contributes roughly two per cent, or over $20 billion, to Canada’s annual GDP (2011). Canada remains the world’s largest producer of newsprint and northern bleached softwood kraft pulp, and demand for the former has seemingly stabilized. In addition, Canada still sits on what is arguably the world’s largest supply of well-managed, high quality conifer wood fibre. Moreover, most of the firms that have survived the travails of the recent past have emerged from the ruins stronger than ever. Domtar, for instance, has focused on producing fine paper and is now one of the world’s leaders in this regard, and Abitibi, rechristened Resolute, is operating only its most efficient mills and has begun diversifying into paper grades other than newsprint. New ideas and innovations also hold out hope for the future. Experiments into wood’s micro- and nanofibres are underway with the aim to create opportunities for turning wood pulp into a host of new products, including environmentally friendly substitutes for plastics. The Forest Products Association of CanadaFPAC represents Canadas wood, pulp, and paper producers nationally and internationally in government, trade, and environmental affairs. Their website offers background information about economic and sustainability issues related to their industry.